A few over the past month or so.. switching the approach a bit to get rid of some "non-core" cards to focus on the core. Love interacting with other members to hear their strategies on collecting. I feel most collectors go through cycles on collecting, from "I hate collecting I am done" to "I want to buy everything". I am probably leaning to the latter right now, but ask me again in a few months! I love the Cobb. Great looking card for the grade, congrats! Packs, congrats on the Mack OJ, they don't surface very frequently. Was very pleased to pick up another Lenox! From my local card shop of all places. I have lived here for 8 years and only been in the shop once. I walked in and asked if they had any t206. They didn’t and I left. That was several years ago. A few weeks back I got the idea to take my youngest son (6 this week) to get his first baseball cards. We each picked out a hobby box. I don’t buy modern cards but it was fun so we continued to do so. Put together my son’s first baseball card set in a binder. After getting to know the owner and letting him know I collect t206 he showed me the one and only t206 he had. Anyone know the where abouts of a DRUM Charlie Rhodes? Nice cards Pete. Travis, congrats on the Lenox. Last edited by Rhotchkiss; 10-15-2018 at 10:03 PM. Thanks to one of our fellow Net54s to help me get this one! Nice Dunn Patrick. Justin has some great cards available! Nice to see so many T210-8s at once. Now all I need is to find a T211 Red Sun Dunn for a type card! Mr Daniels - there and back again. Here's one that has bounced around for while. I'm pretty sure that some of you have been caretaker, and some - including myself in that list - more than once. He's been away for more than 5 years, but will settle in for a while once he arrives. Thanks for providing him with an extended stay Brian! Send a private message to Tom S.
Find all posts by Tom S.
Very nice - the colors on some of the E-90s are outstanding. Last edited by Jobu; 10-18-2018 at 11:33 PM. Last edited by Rhotchkiss; 10-19-2018 at 02:07 PM. DAMN!!!! Nice one Ryan! Big congrats! Wowzers ... that's so nice ... shame it's such a small pic. Killer card Ryan. Iconic to say the least and the "Best of the Best"! My sincere Congrats buddy! WaJo added to my PC796 collection. Thanks to Brockelman for this one. Wow Ryan!!! Yuuuuuge. Go big or go home. Congrats!!! Brian - Nice WaJo. Well done. You're amassing a very nice PC collection. Thanks All. I agree with Dean (great look Young Portrait with the rarer back BTW), Brian is rather quickly assembling a serious, heavyweight PC collection. Trying to complete the REAL "Monster", the T210 set. The Series 8 cards are nightmares to find but I now have about 75% of the Series (no Joe Jax) and still searching. Grabbed these 5 on eBay last night which helps. Excited to finally find a presentable Bill Bergen T3 Turkey Red. Picked up a couple more E90-1s from Scott's recent auction. Ryan, as I told you the other day, amazing pick up! Congrats. When you post pics on your iPhone, there's a way to do it larger, I forget how tho. Well.... 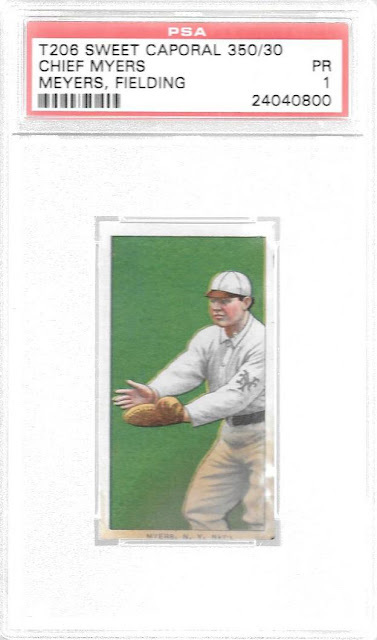 I am not keeping 2 Cobb Fieldings, but after picking up the SGC a great opportunity came along to get a nicer one...when it rains it pours...so I pulled the trigger and this one will remain in my collection with the SGC going off to an auction house. Haven't picked up anything for my collection in quite some time, but I just couldn't pass up this 1936 Wheaties Gabby Hartnett Series 3. 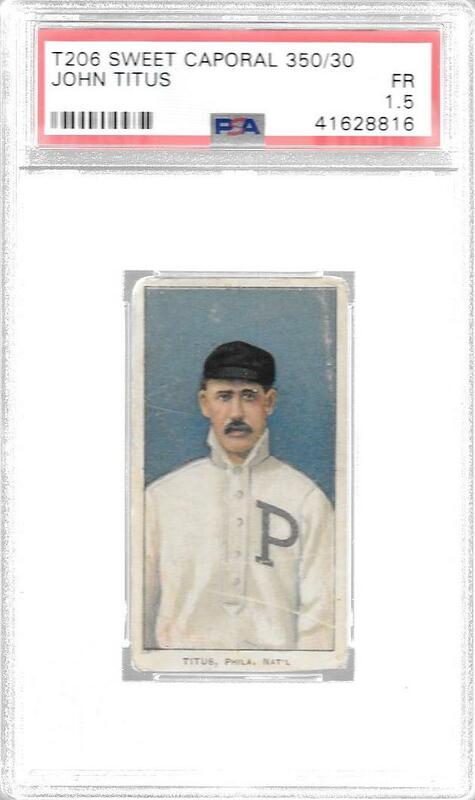 Has a crease going up left side in the blue in the border, but it is the first one with the full border I've been able to find and presents nicely. Ryan, fantastic Mathewson; Brian same with that Cobb fielding. Nice DJ...is that 1 of 2 or 3 known?? Hey Jerry, I can account for 4 more McGraws in addition to this one. A recent return from PSA. The mustached one himself. Happy to have it back in-hand. They somehow missed the trimmed border at the bottom when grading it a 1.5. Wow! That is a very egregious trim on the bottom. Once again, PSA proves their expertise and justifies the silly premiums their cards get over SGC (and BVG). Amen. That's an awful miss. So neat to see everyone so fired up here. Some of those pick ups are divine. It was a slow month here but there was a small addition. Couldn't resist plucking a couple things from the estate of George Scott. Here are images of his lifetime pass and the first pro contract as an 18-year old. Some years ago I finally put aside the excuses and built a site about my collection. It has a page for every HoFer and a couple hundred other baseball figures. It's called CooperstownExpert.com. If you have a favorite guy, or too much time on your hands, check it out. Thanks for sharing your pick ups! !